Does your office need more space for filing? Are you spending money on offsite file storage? Do your employees spend the majority of their time looking for misplaced files? If you answered yes to any of these questions, then continue reading to see how sliding mobile shelves will solve your office’s storage problems. Sliding mobile shelves are an excellent way for your office to save space. 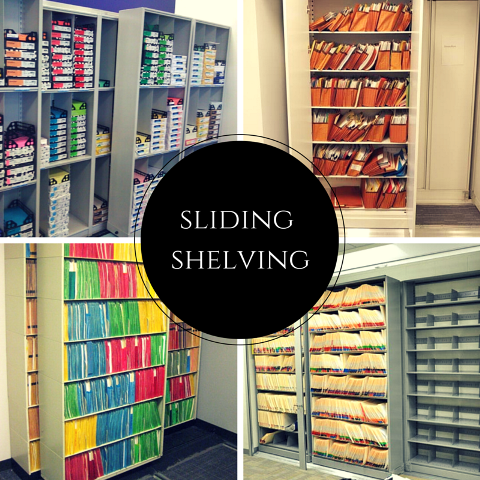 You will use significantly less floor space compared to traditional filing cabinets or open shelving because sliding mobile shelves remove unnecessary access aisles. The shelves are stacked, one in front of the other, and attached to floor tracks. To access items stored in the back, you simply slide the front rows over. This will allow you to increase your storage capacity in the same space. Most offices need storage for more than just files. There are all types of items that need to be stored such as binders, computer media, and office supplies that just don’t fit in traditional lateral cabinets. Well you can store files along with all of these items and more in sliding mobile shelves, which will reduce office clutter. Because sliding mobile shelves will increase your capacity, you can centralize your storage into one easy to access area. Employees will no longer have to roam around different office areas searching for stored items, which will improve their productivity. If you are ready to see how great your office could function with sliding mobile shelves, then start shopping now at StoreMoreStore. We’ve got all sizes and configurations of sliding mobile shelves that will work in your office. And if you can’t find what you’re looking for, give us a call at 1-855-786-7667.